No, I'm not talking Game of Thrones. I'm talking the end of autumn. If you're local, you know it has already snowed this week. The time has come for the end of pumpkins and owls and warm colours and smells. Stores seem to consider Halloween over already and the oppressive winter displays that have been creeping in since September are now being given free reign. Christmas is taking over. It's officially time to switch gears. 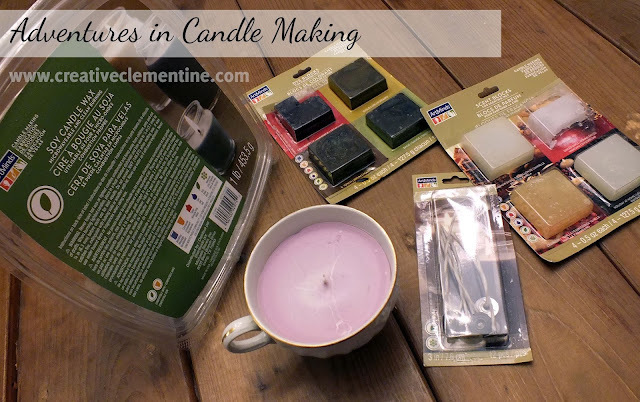 That being said, now seemed like as good a time as any to tell you about a Christmas gift idea I attempted but did not entirely follow through with last year: candle making. Let's start with this disclaimer: I did not do anything fancy. I bought the standard craft-store ingredients to make fairly expensive homemade soy candles. I did not pour anything into a mold, or dip any wicks like in third grade pioneer studies. I just melted some soy wax, added some stuff to it, poured it into adorable teacups and hoped for the best. I ended up making something even more awesome for the person I had in mind, and decided to keep the candles. I did learn a few things, however, that I will share with you now. The amount of colour they tell you to add is a lie. See that pretty lilac colour my candle turned out? That was supposed to be a deep cranberry red. This is what I get for following the directions. The amount of scent they tell you to add is not a lie. My candles don't even need to be lit to make a room smell divine. Unfortunately, because of discovery #1, this means I have weird lilac-coloured, apple-scented teacup candles. Quite the combo. The wick needs to be turbo stuck to the bottom to not ruin everything. In failing this, you could use my trick of strategically placed clothespins to hold the wick in the centre.... but its probably easier to do it right the first time. Don't touch it--even when it seems okay to. As you can see from the photos, pretty much anything that touches the top will leave a mark. Unless you can strategically scratch perfect snow angels into your candle, you probably want to avoid any contact. Failing this, it sorta has the effect of being old or re-gifted, rather than the awesome homemade splendour it is. 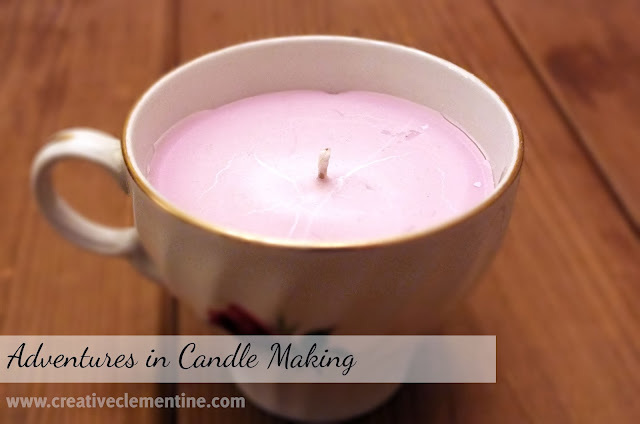 If you're planning on embarking on a candle-making adventure of your own, I hope my notes are helpful! Keep in mind I have never tried anything but soy wax, so am not sure if these are universal truths in candle making.